Visiting St. Petersburg President of the Republic of Azerbaijan Ilham Aliyev has met at the conference hall of the hotel “Evropa” with representatives of the Azerbaijani Diaspora living in the Northern capital of Russia. Opening the meeting, Consul of Azerbaijan in St. Petersburg Gudsi Osmanov stressed the invaluable role of national leader Heydar Aliyev in consolidation of the Azerbaijani Diaspora throughout the world, particularly, in St Petersburg. Speaking of the activity of the National cultural autonomy of St. Petersburg, participants of the meeting noted Azerbaijanis living in this city had always trying to safeguard their national originality. In turn, President Ilham Aliyev said the leadership of the country attached great importance to consolidation of the Azerbaijani Diaspora. 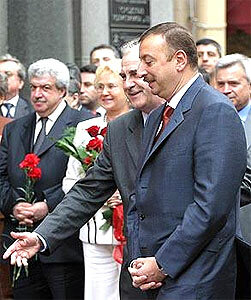 In this context, he touched on the activity of the All-Russian Azerbaijani Congress. The Head of State added that economic achievements in Azerbaijan would have immediate impact on the status of our compatriots around the world. He appreciated the active involvement of Azerbaijani businessmen living outside the country in realization of the regional projects. City news archive for 16 June' 2005. City news archive for June' 2005.